In this book, the authors present the latest research results in the multimedia and semantic web communities, bridging the "Semantic Gap"
This book explains, collects and reports on the latest research results that aim at narrowing the so-called multimedia "Semantic Gap": the large disparity between descriptions of multimedia content that can be computed automatically, and the richness and subjectivity of semantics in user queries and human interpretations of audiovisual media. Addressing the grand challenge posed by the "Semantic Gap" requires a multi-disciplinary approach (computer science, computer vision and signal processing, cognitive science, web science, etc.) and this is reflected in recent research in this area. In addition, the book targets an interdisciplinary community, and in particular the Multimedia and the Semantic Web communities. Finally, the authors provide both the fundamental knowledge and the latest state-of-the-art results from both communities with the goal of making the knowledge of one community available to the other. Raphaël Troncy obtained his Master's thesis with honours in computer science at the University Joseph Fourier of Grenoble, France. He received his PhD with honours in 2004. His research interests include Semantic Web and Multimedia Technologies, Knowledge Representation, Ontology Modeling and Alignment. Raphaël Troncy is an expert in audio visual metadata and in combining existing metadata standards (such as MPEG-7) with current Semantic Web technologies. Benoit Huet received his BSc degree in computer science and engineering from the Ecole Superieure de Technologie Electrique (Groupe ESIEE, France) in 1992. In 1993, he was awarded the MSc degree in Artificial Intelligence from the University of Westminster (UK) with distinction. He received his PhD degree in Computer Science from the University of York (UK). His research interests include computer vision, content-based retrieval, multimedia data mining and indexing (still and/or moving images) and pattern recognition. Simon Schenk is a research and teaching assistant at the Information Systems and Semantic Web Group of University of Koblenz-Landau.Simon is working towards his PhD degree under the supervision of Professor Dr. Steffen Staab. Previously, he has worked as a consultant for Capgemini. Schenk studied at NORDAKADEMIE University of Applied Sciences, Germany and Karlstads Universitet, Sweden and received his diploma in Computer Science and Business Management from NORDAKADEMIE in 2004. 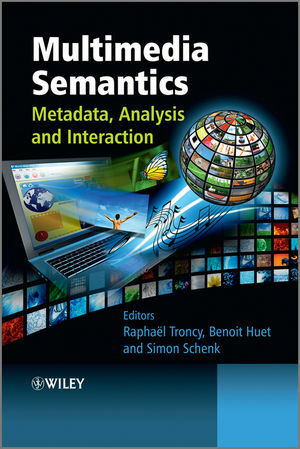 Multimedia Semantics Visit the accompanying website to access user cases, datasets, and software mentioned in the book, as well as links to the K-Space NoE and the SMaRT society web sites.